It was a bit of serendipity that we met Nina Motta, a neighbor who doesn’t exactly live next door but, nonetheless nearby. Our dogs brought us together, my walking our schnauzer, Treat, who has long departed us, and Nina walking her beloved Ozzie, a very affectionate golden retriever, who has also now passed on, devastating to Nina. But while walking our dogs we found we had much in common, so much that we began to socialize given our mutual interests and sensibilities. We met some of her family who were visiting Florida. Three of her siblings are professional musicians and there was an impromptu concert at her beautiful home. Nina was a guest at my 65th birthday where I played the piano, accompanying a singer with whom I used to perform. So from time to time we’d go out to dinner, or have dinner at each others’ homes. When visiting Nina’s home we were struck by her paintings. Yes, in addition to her musical abilities, she is an accomplished, award winning artist. There was a particular painting I was drawn to, one of a young woman at a piano, making a notation on a score. It took my breath away and Nina said she could make a copy for us. I naturally envisioned it over our piano. That was several years ago and once in a while I would remind her of her promise. But like all of us, although we mean well in making a grand gesture, I believe it often escaped her memory and more importantly, I didn’t want to perpetually bug her about it, although from time to time she’d bring it up herself saying she hadn’t forgotten. Several weeks ago she called to ask whether she could come by. We thought it was to schmooze a little, have a glass of wine, catch up (we had just returned from our summer in Connecticut). She arrived with a rolled up canvas. Could this be it, I wondered? We cleared the dining room table and as she unrolled the canvas we were truly taken back: not only that “a promise made became a promise kept,” but what unfolded seemed to be the original. No, she explained, this was a professionally prepared giclée, a high quality digital image of the painting, using pigmented inks onto museum quality canvas. It is not a lithograph but, in many respects, an “original” as well. I haven’t held it up against the original painting but I suspect it is indeed an exact copy. It’s certainly the way I remember the painting. Well, she said, you now have to pick out a frame and have the canvas stretched, and after I said we’ve used a local art store nearby, she said don’t use them for this! Yes, ma'am! So she promised to recommend a few other options which she did and we went to the Easel Art Supply Center in Lake Park, a family owned store which has been around for years. Lucky we did, they just happened to have in stock a few frames for a 30” x 40” painting. We had expected that it would have to be custom framed. They had three frames, each of which seemed to go well with the painting. So, which to choose? Fortunately, a graphic artist was wandering about the store so we asked her opinion. She immediately pointed out that the frame we finally chose brought out the highlights in the painting. Also, we thought, as there was a certain subtle, Asian-inspired design in the corners of the frame, it would fit perfectly in our living room (similarly decorated) and of course over the piano. When we picked up the finished frame we immediately asked Nina to come over to help us position it. I think she too was taken back not only by the quality of the frame but how the painting was enhanced by it. To understand more about the painting, I “interviewed” Nina, wanting to know all about not only the painting, but what brought her to art from her grounding in music. So, Nina, when and why did you begin to paint, especially given that you and many in your family were trained as musicians? It was just during the past 10 years that I began my journey into the wonderful world of art and painting. 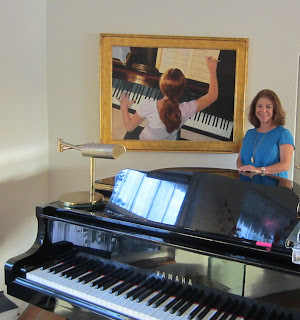 Yes, I grew up in a family of musicians -- my mother was a classically trained pianist and three of my six siblings are professional musicians. All of us had to choose and play an instrument. I played the piano, cello and sang as an alto in choruses through the years. Art never seemed to come into the forefront of extracurricular activities, as music was a family mandate. That being said, I had fleeting moments of curiosity about painting as my father painted quietly in his studio at home. Every now and then I'd peek in and look at his work on the easel, but rarely was there discussion and the studio was off limits to the kids. I suppose a little seed had been planted. There is an indelible connection between music and art. The cadence of a phrase, the emotional swelling/receding of a dynamic, the sonorous voice of a baritone is all like the decisive brush strokes and values on a canvas. Was there a particular catalyst that brought you to art? After a shakeup in my life about 15 years ago and addressing what I creatively wanted to do moving forward, I decided to unearth my inclination toward art and explore two dimensional art as my new project and creative expression. I wanted to dig my heels into it and although a bit unsure, I was determined to learn, work hard and hopefully get good at it. My first steps toward becoming an artist were in drawing classes. I enrolled in one after another. I began using pencil and charcoal because colors, color mixing and color theory were intimidating. I took introductory and intermediate drawing classes and then began painting classes. I have taken workshops and painting classes for several years. From that point onward, I found great emotional connection to painting. Painting requires disciplined practice. Levels of frustration can be debilitating. Perseverance, consistency, studying the process and especially a good teacher are a must. Hard work pays off and painting can be a joy, bring great satisfaction and be rewarding. I find I am drawn to figurative work in my paintings. Thinking of the painting you so generously gave to us, I suspect your life as a musician led you to the subject? It seemed only natural to connect music and art, so painting musicians as my subject matter was my decision for several of my beginning paintings. The artist's hope is to find one's passion, express it and engage the viewer. The piece of Jessica came about when my niece Jessica, who had been studying architecture at the University of Miami, came to visit one weekend. As an architecture major, her grueling schedule gave her very little time to go to the piano labs on campus to play, so coming to visit gave her family time and piano time. She is a multi talented young woman and has a commanding ability at the piano. I asked her to play a piece so I could take a few photographs as possible references for a painting. All my paintings are from my own photographic references. To make it interesting, I stood on a ladder behind her and the pictures were taken from above looking downward. The perspective was what made this piece so exciting. 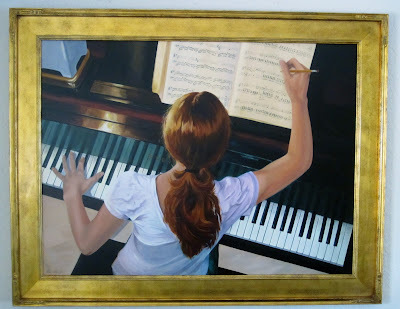 What piece is she playing in the painting and how did you “paint” the notes? We chose Chopin Prelude Op.28, No. 4 as the piece she'd be "playing”. The painting is an oil painting; however the notes of the piece were all painstakingly done in pencil. It was done without using any projection. Everything was calculated by eye, using rulers for measurement and pencil sketching first to lay in the subject on the canvas. As you know the canvas size is large, 30" X 40"and this piece took about eight months to complete. I remember seeing an exhibition of your paintings at the Maltz Jupiter Theatre. Has this painting been entered in any competitions? It was awarded 2nd Place --The Mary Snow Corr Award -- in 2010 at the Lighthouse Art Center in Tequesta, Florida. I’m surprised that you haven’t entered it in other competitions. The artist's hope is to find one's passion, express it and engage the viewer. I believe this piece engaged you and Ann and that is the best reward an artist can receive. Indeed, Nina, we are engaged and in love with the painting and with you! As I said, I feel I have company now when I play, you and your niece. Unfortunately, I am merely an interpreter of the Great American Songbook, never having had classical training, and as much as I would love to be able to play Chopin’s Prelude Op.28, No. 4, I’ll have to be content playing my tunes. Recently I found myself playing Never Never Land, a nostalgic song sung by Peter Pan (Mary Martin in the original 1954 Broadway show) in which Peter muses about the dreamy land where he lives. The great Jule Styne wrote the music while the lyrics were written by the legendary Betty Comden and Adolph Green team. So I offer a brief rendition of it here (although it may not play on mobile devices) as I think, Nina, you are a dreamer.